I picked up a 'dead' 1999 Husky CR125 relatively cheap from the breakers, it was in a complete state with virtually every bearing requiring to be replaced, missing piston, shot fork seals and a seized gearbox. Decided that I'd resurrect the poor beastie but could not get a bottom end to suit. I replaced all the swingarm bearings (including the linkage), changed the fork-seals, powder coated the frame and re-saddled it while I waited for a gearbox to turn up, but in two months I still could not get my hands on a bottom end to suit. 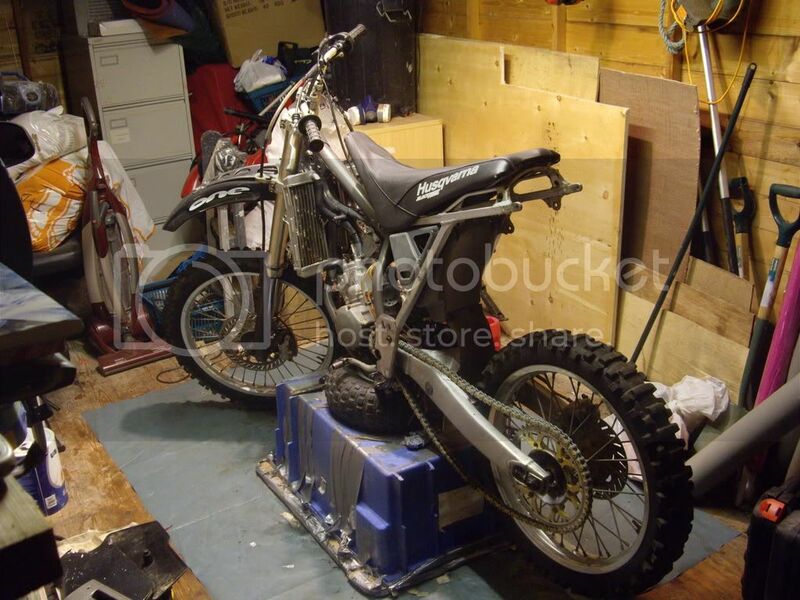 At this point (and I nervously write this next part due to having read a recent posting from someone who had fitted a thumb throttle to a YZ250 and got shot down for being a 'radical') I cast my eyes accross the shed towards an old '96 YZ125 engine that I'd managed to aquire years ago. I looked at the two engines for a while and finally decided that I could 'crowbar' the YZ unit into the Husky frame. After spending two weeks solid in the shed at the bottom of my garden meshing cooling systems, altering engine mounts, machining new swing-arm spindle/rear engine mount bushings... I finally emerged with what I believe to be the worlds first 'YZSKY'. The bike now looks excellent, starts first or second kick, and even rides perfectly.. until you get to about 3/4 revs, at which point it seems to top out (sounds like a chainsaw at full revs) before the power-band. I've currently got the Husky carb installed, but I have tried the YZ carb and it does exactly the same thing. I've checked the reeds (some sort of old style Boyesen Rad) and found that the secondary reed (the one that lies on top of the larger reed) is damaged. I've picked up a new Boyesen Rad cage and reeds from Ebay and I'm still waiting for them to arrive. I believe that the secondary reed is for throttle response at lower revs so I'm not convinced that it's the root of the issue. Has anyone come accross this issue with this type of engine? Could it be the main jet? Last edited by pragmatic393; 08-14-2007 at 10:27 AM. How do I post pictures on here? Sounds creative, certainly not the norm. But I bet you have the only Yamavarna or Huskaha out there. Post them pics up. 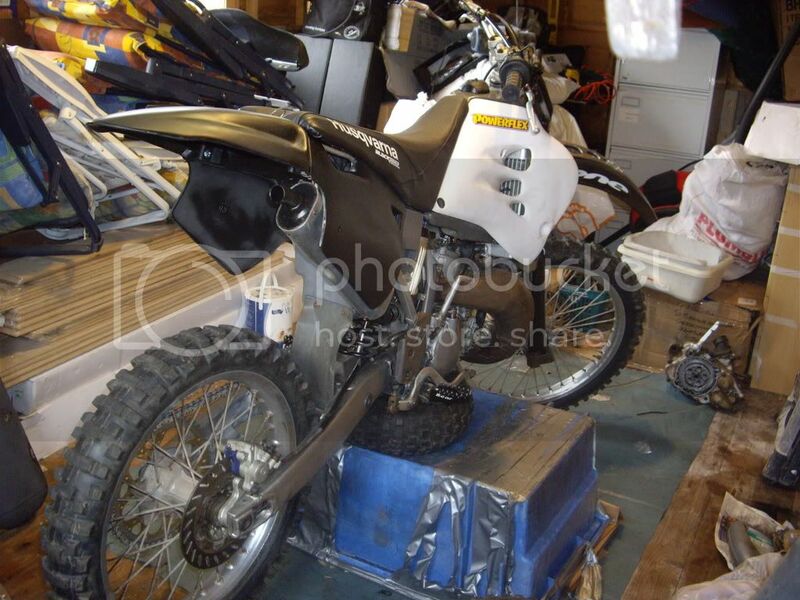 You sound like a capable mechanic, but you ARE using the YZ ignition and pipe, right? I want to see it! Location: Houston..Manvel to be exact. I can't wait to see pics. Have you checked to see if the power valve is stuck? Interesting combination,, as I have owned a 99 Husky CR125 and a 96 YZ125 at the same time (the YZ was my teenage son's). But both were running fine so there was never any thought of crossbreeding them. Which was faster, the YZ or the Husky? I've kept the original mounts for the Husky engine in place, so basically the engine's are interchangeable (if I can get the Husky running). Plan was to repair the Husky engine and re-install it, but if the YZ's a better engine I might not bother... probably good to have a spare though. Just wondering if I could stick on a third set of mounts for a four stroke... might be nice to have the option to change! Last edited by pragmatic393; 08-14-2007 at 03:55 PM. Fixed it for ya. Nice project, keep us updated! Last edited by pragmatic393; 08-14-2007 at 03:47 PM. Thats a Rowdy bike man. good project. I have a 440 snowmobile engine I wanna stick into something maybe Ill find a golf cart or a go cart carcass laying around somewhere some day. Or a lawnmower thatd be kool.